BUNER, Pakistan (CNN) -- The Pakistani military claimed Friday to have broken the backs of Taliban militants in the Swat region. 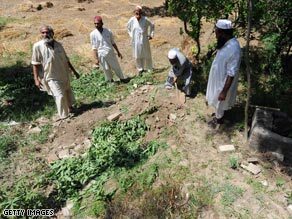 Pakistan residents cover a grave after burying a suspected Taliban militant, who was killed during fighting. The military made the claim while escorting journalists into the country's volatile war zone. But fighting continues in the Peochar Valley, an area that intersects with Swat, the main location of the army's offensive against Taliban militants advancing across North West Frontier Province. This is the scenario gleaned by journalists Friday during a tour of the battle front with the Pakistani military. Journalists flew by helicopter with the Pakistani military to Khwazakhela, an area north of the large Swat city of Mingora, and got a glimpse of the battle zone.